Never be blinded by the sun again! 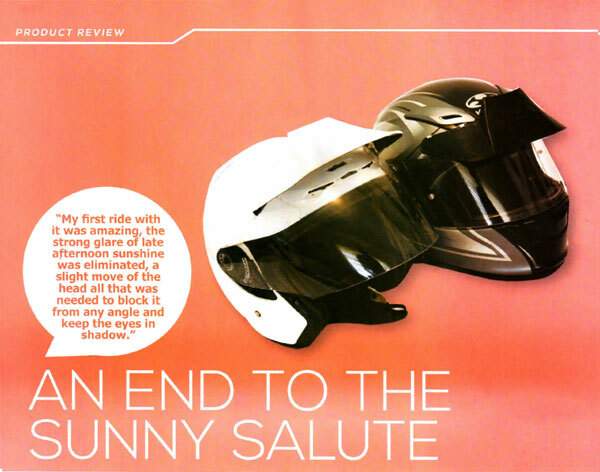 The SUPER-VISOR offers a completely new concept in motorcycle safety. Being blinded by the sun is potentially one of the most dangerous situations you can face as a rider. With the SUPER-VISOR, that danger is alleviated with a slight tilt of the head. Clear vision is renewed and safety and comfort are maintained. The SUPER-VISOR was developed as a simple low cost solution to a dangerous riding situation. Very reasonably priced to allow all riders to enjoy the sun blocking benefits of SUPER-VISOR, this product can be installed on almost ANY FULL FACE AND OPEN FACE HELMET WITH A FACE SHIELD. Digitally engineered in DOT-approved plastic, the SUPER-VISOR’s aerodynamic styling will actually improve the look of most helmets and reduce wind noise from your helmet. Now the latest innovation in motorcycle safety can be yours with SUPER-VISOR. Super-Visor allows You To Ride Safely Into the Sun. No more military salute riding. Super-Visor is Stylish, Aerodynamic, Vented to relieve pressure and feed air into helmet vents. Super-Visor helps reduce helmet wind noise. 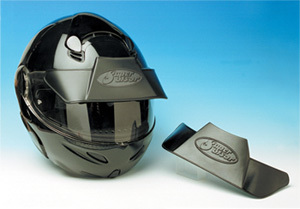 Super-Visor fits All Full Face and Open Face Helmets with a Face Shield. Super-Visor mounting height is adjustable, if needed by using the lift kit. Super-Visor is removable from Face Shield. Super-Visor is available in 3 Colors Black, White & Smoke. This device had been around for a while, but I had never seen one until a few weeks ago. Spotting it on the helmet of riding mate Peter B, I learned that it is called the Super-Visor, is made under a patent in the USA and sold in Australia by Rocky Creek Designs. Taking the plunge, I bought two, a black one for my Kubuto full-face and white for my M2R open-face. Super-Visor can only be used on an open-face helmet if it is fitted with a face shield, so I was okay. It is actually secured to the shield by four clips, which are fastened to the shield with adhesive pads and a very strong glue. For nearly two weeks I sat and stared at my new toys, reluctant to risk getting it wrong at the gluing stage, but I finally bit the bullet and "had a go." Big advice - read the instructions carefully and follow them with even greater care. An extra pair of hands is useful too, for marking where the clips are to go and when fitting the Super-Visor. My first ride with it was amazing, the strong glare of late afternoon sunshine was eliminated, a slight move of the head all that was needed to block it from any angle and keep the eyes in shadow. What I did not expect was the aerodynamic efficiency; it actually reduces the 'bobbing head' syndrome that causes neck and shoulder pain on long rides. Super-Visor is sold in the USA witha mounting kit to adjust height as an option, but here the kit is included in the $35 purchase from rockycreekdesigns.com.au. Do I like it? I love it. No more 'salute' with a raised hand to block the glare for me. Copyright © Super-Visor. All Rights Reserved.